"For all 12V lead-acid batteries from 1.2-32Ah such as batteries found in Riders and Tractors etc. The charger is suitable for maintenance charging up to 100Ah. Perfect for seasonal vehicles. Fully automatic for optimal charging and maintenance charging that maximises battery life and performance. No sparks, short-circuit proof and reverse-polarity protected for untroubled usage. Water resistant (IP 65) for use outdoors even if it rains or snows. 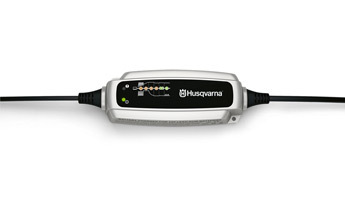 Use together with Husqvarnas Battery status indicator."